Much has been spoken and discussed about and debated on regarding the existing political quagmire. With many ifs and buts, the President has started to act in such a manner that the entire nation is confused at the moment. While many took to rejoicing on the streets, the prevailing situation doesn’t seem to be a reason to rejoice at all. One life was already taken away. Legal experts claim that the move to remove the existing Prime Minister was unconstitutional and taking another dangerous step forward, the President also prorogued Parliament till November 16. The Cabinet too is in the process being subject to change in a possible move to manipulate the majority vote. Those who voted in favour of the Yahapalanaya regime on January 8, 2015 wouldn’t have expected this turn of events. But the damage has already been done and whether it is reversible or not remains the question. Hence the Daily Mirror spoke to several experts to shed light on the prevailing situation. “Actually this should be decided by the Parliament,” said Lal Wijenayake Attorney-at-Law and Chairman of the Public Representations Committee on Constitutional Reform. “Therefore the President’s decision is illegal. If President Sirisena had a doubt about Ranil Wickremesinghe’s majority he should have asked him (RW) to show his majority in Parliament. That would have been the proper way to do it. In fact this is how it is being done in most democracies including India when major crossovers take place. Even now it’s not too late to summon the Parliament. This is because the Parliament is the most supreme institution in the country. Proroguing is an anti-democratic move. After taking such a step he has even decided to prorogue it for two or three weeks. This is actually a crime. 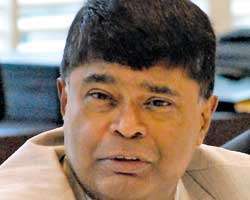 The President’s actions have divided the society, public service, Police, armed forces and if further delayed the situation will worsen,” said Wijenayake. He further said that Mahinda Rajapaksa does not have the majority. “By proroguing the Parliament they are trying to manipulate the majority. We are well aware of how a majority could be manipulated. The President acted unconstitutionally by removing the Prime Minister and again suppressed democratic rights by proroguing the Parliament. Therefore there should be an impeachment order against him since he has violated the Constitution. This damage has grabbed international attention as well. But the damage could be minimised if he summons the Parliament immediately,” he added. 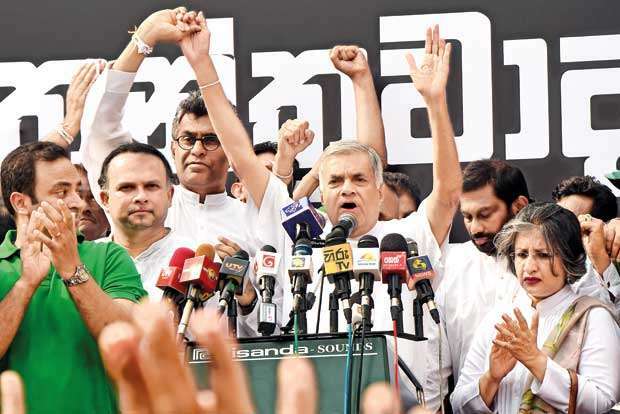 According to Prof. Sarath Wijesooriya, civil rights activist and convener of the Movement for a Just Society, the President’s decision is a deathly blow to democracy. “The country has experienced a divide and the poor people have begun to fight. This is not a good sign. If MR (Mahinda Rajapaksa) has a majority of 113 then why are they proroguing Parliament? What they are trying to do now is appoint a miniature Cabinet and convince people to crossover. “The President initially said that he would abide by the law, but it doesn’t seem to be the case anymore,” Prof. Wijesooriya continued. “He got rid of Chandrika Bandaranaike Kumaratunga, Ven. Sobhitha Thera and others who helped him to acquire the hot seat and he himself made a U-turn. The President himself claimed that MR has threatened to kill him five times and here he is joining hands with MR once again. This is undemocratic and the only solution is to convene Parliament immediately,” said Prof. Wijesuriya. Transparency International Sri Lanka (TISL)– a National chapter of Transparency International and the leading global movement against corruption- also expressed its concerns regarding the prevailing constitutional crisis. In a statement issued they stated that the TISL wishes to state that it’s imperative that Parliament is convened immediately to resolve the political instability that has arisen. TISL is concerned that the prorogation of Parliament until November 16 has created a climate that is ripe for political horse-trading leading to the corruption of the people’s mandate. The statement also quoted TISL Executive Director Asoka Obeyesekere as follows saying, “In the context of the prevailing political culture and past experiences, closing the doors of Parliament to enable deal making has already led to allegations of monetary inducements for loyalty. This will further undermine public trust and the mandate of good governance which President Sirisena pledged to uphold in his address to the nation on Sunday. Given the atmosphere of uncertainty that has currently engulfed the political systems of the country, it is of utmost importance that Parliament as the apex representative of the people, should be given the opportunity to be open and accountable to the public”. All parties must recognise that “sovereignty is in the people and is inalienable” (Art. 3 – Constitution). TISL calls on all political stakeholders of the country to protect democracy and resolve this crisis in the best interests of the people, upholding the spirit of transparency and accountability. Former State Minister and member of the Liberal Party of Sri Lanka Prof. Rajiva Wijesinha said that he doesn’t see a necessity to convene the Parliament. “There has been a practice to prorogue Parliament especially like during the time of Premadasa’s impeachment motion, then in 1964 during Sirimavo Bandaranaike’s regime and in 2001 during Chandrika Kumaratunga’s regime. Since the President has prorogued parliament it’s now a matter of waiting till November 16. When you have an ambiguous constitution on the dismissal of the Prime Minister there are three alternatives as solutions. Either go to courts, seek a Parliamentary vote or allow the people to respond. But by now Ranil Wickremesinghe must have realised that the country is not in his favour. In fact the President should have taken this decision after the Local Government Elections back in February. I also think that the rest of the UNPers must be seeing this as a opportunity to bring about Party reforms as it is important to maintain inner party democracy,” said Prof. Wijesinha. Airing his views General Secretary of the United National Freedom Front and attorney-at-law Maithri Gunaratne said that the previous Government led by Ranil Wickremesinghe was a coalition Government. “Therefore they were able to limit it to 30 members with an exception that if a coalition Government or a national Government was brought in that the numbers would exceed. When the Sri Lanka Freedom Party pulled out of the coalition Government the Cabinet that has been appointed ceased to exist. Then the PM also ceases to exist. Then the President could appoint a capable person who has the ability to command the Parliament at his discretion. He further said that once Parliament has been summoned and if the incumbent Premier cannot pass a Budget or a no confidence motion then he ceases to exist. Until then he can function. That’s how Ranil functioned from January 8, 2015 till August. Each and every member of the Parliament will support the incumbent Prime Minister on a case-by-case basis. We are alarmed by the recent turn of events, where Maithripala Sirisena has called upon Mahinda Rajapaksa, who does not command a majority in the Parliament, to form the Government. In 2015, the country voted in Sirisena, on the promise of change and good governance. The majority of people voted in the Coalition Government too, in the General Elections, with Ranil Wickremesinghe at the helm. Neither Wickremesinghe nor President Sirisena has kept the promises made to the people. The past three years have seen manoeuvres between warring factions and divided loyalties while self-serving opportunism ruled the day. The current move is simply a culmination of these acts. Although there have been some positive changes during this period of rule, such as the opening of space for civil discourse and freedom of speech, the legislation of the Right to Information Act and the return of some military-held lands, the Yahapalana regime’s neoliberal policies, not to mention the impending Counter Terrorism Act (CTA), built on similar policies of the previous regime, provided little relief to the people. With a global economic crisis looming large, the country is facing challenges all round. The announcement of the President calling upon Rajapaksa to form the Government, and then proroguing the Parliament, makes us think that Rajapaksa doesn’t have a majority at this moment. Such a postponement also signals a time of political manipulation of a precarious situation and warns of a premeditated and near autocratic take over. It weakens the already fragile fabric of democracy and spells further danger to dissent, protest and people’s collective action. The past three years have seen manoeuvres between warring factions and divided loyalties while self-serving opportunism ruled the day. The struggle for democracy is not just about the Constitution. It resides in economic, social, and individual welfare, the right to dissent, and a commitment to pluralism. Although it’s important to consider the unconstitutionality of the President’s act and the precedence that it sets, our concerns go beyond those of a constitutional crisis. We want to stress that a democratic process needs to be cherished and upheld at all times. Rather than continuing to support the ‘lesser evil’, let’s work towards bringing all people together as a citizenry to build hope for our collective futures. We wish to call upon all those in positions of power, particularly all political actors, to pledge their support for democratic processes. At the same time, we wish to pledge our support for democratic action. This is the moment to begin a collective action by students, teachers, workers, women’s groups, religious groups, and others working toward social justice, to form a coalition and a counter force against authoritarian reaction. It is with a sense of shock and dismay that the people of Sri Lanka received the announcement on Friday evening on October 26 of the swearing-in of Minister Mahinda Rajapaksa as the Prime Minister of our country by President Maithripala Sirisena, and the removal of the serving Prime Minister, Ranil Wickremesinghe from such office. We are a wounded nation recovering from war and violence and amidst severe economic burden on the people, cannot at any cost afford another crisis which can plunge the country into further chaos. The National Christian Council of Sri Lanka (NCCSL) takes serious note of this political development and considers this unprecedented move which is questionable in terms of the accepted norms of democratic principles and the provisions in our Constitution. It is our belief that the matter should have been best resolved in Parliament in a transparent manner with adherence to stipulated and clear procedures. The turn of events, shrouded in secrecy and surprise, which we regret, have raised many questions in the minds of our people instilling fear and uncertainty as we witness two competing Prime Ministers together with their respective parties jostling for power, authority and legitimacy for state rule. In this process, whilst noting with sadness the subjection of state institutions to force and intimidation for political control, we also admire the patience of the general public who await a solution to this prevailing crisis within constitutional and judicial formalities. Hence, the National Christian Council of Sri Lanka (NCCSL) as a religious entity with no affiliation to any political party or personality, appeals to the President to uphold the democratic traditions and the sanctity of our Constitution bearing in mind the mandate he received from the people when he was elected into office and calls upon its people and leaders of every sphere to act with prudence to uphold the sovereignty and integrity of the nation. In the meantime a petition has also been circulated by the Citizen’s Movement which condemns the President’s actions and calls for Parliament to be convened. The turn of events, shrouded in secrecy and surprise, which we regret, have raised many questions in the minds of our people instilling fear and uncertainty as we witness two competing Prime Ministers together with their respective parties jostling for power, authority and legitimacy for state rule.